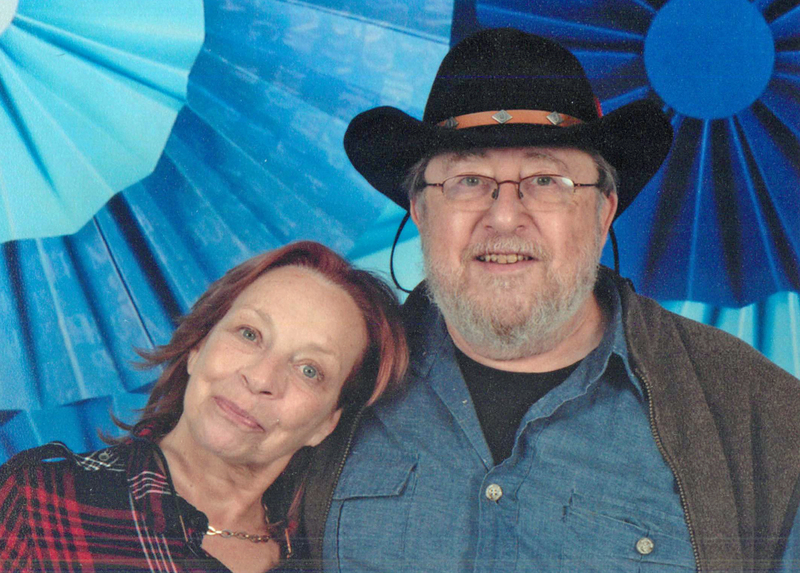 We have talked about a Holiday Cruise for about 25 years. We had been on a couple of cruises by then and thought it would be an interesting change of pace. The only problem is that we were expected to host the family for Christmas dinner - something we did for more than 35 years. This year we were free from that obligation so we went hunting for a holiday cruise. 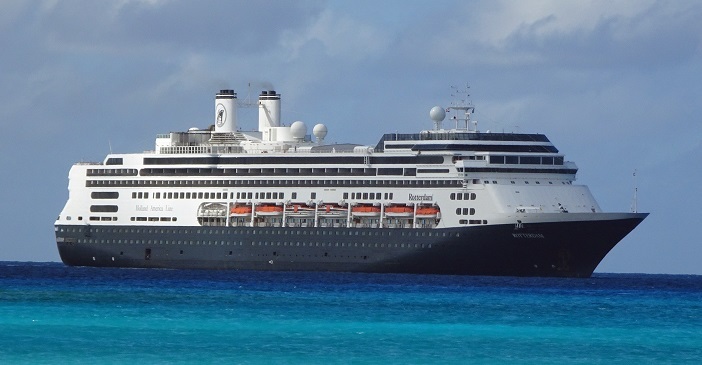 The short list came down to a 14 day Southern Caribbean departing December 19 on the ms Rotterdam and a 15 day Southern Caribbean departing December 18 on the ms Prinsendam. It was a close race but we picked the former for a variety of small reasons. Here is an overview of our activities. Please note that details may be scarce at points since we are only writing this up a couple of weeks after the fact based on scarce notes and suspect memories. We were booked on AC1600 departing Montreal (YUL) for Fort Lauderdale (FLL) at 06:45. We had managed an upgrade to business class. We headed off to the airport with 3 hours to spare which turned out to be a good thing. Check in and security were relatively painless then we hit US Immigration. We went through a brief exercise in prescanning our passports etc at a terminal then we were directed into one of 2 lines. The other line involved brief checks and folks seemed to get through in 10-15 minutes. Our line was long and only had 1 or 2 agents working. It took us about 90 minutes to get to our chance to do our 30 second check in. Many folks around us missed their flights. We had originally planned to spend some time relaxing and snacking in the AC Business Class lounge but we could only grab a coffee and head for the gate where the flight was already boarding. Overhead space left was barely enough to jam in our coats. The flight was delayed while they removed the bags for a couple of folks who were probably still stuck in the immigration line then a further delay for de-icing. Beyond that the flight was pleasant and we were well treated. Breakfast was excellent. We arrived in FLL, picked up our bags and went to check with the Holland America folks. Turns out we did not have transfers booked but that was readily fixed. The transfer to the ship was uneventful and check in not a vast misery. Cabins were ready by the time we got aboard so we dumped off our coats and went off to explore until our bags caught up with us. Lillian was a bit frustrated because she could not smoke until refueling was completed but we soothed ourselves with a snack and a drink. The ship layout was basically the same as the ms Veendam which we had been on for our spring cruise except that the floors were differently numbered though they had the same names. At 15:15 we had the routine boat drill. Our captain (Hans Mateboer) got pretty testy with a small percentage of the passengers who did not participate or were slow while the rest of us waited for them. We sailed pretty much on time at 16:14. We unpacked and headed off for dinner in the dining room then lounged around the bars on the Upper Promenade. The ship was safely anchored off Half Moon Cay by 07:30 after sailing 274 nautical miles at 19.1 Kts. Half Moon Cay is a Holland America private island. It was originally known as Little San Salvador Island until Holland America Line purchased the island in December, 1996 for a price of US$6 million. We were the only cruise there for the day. We had a leisurely breakfast in the dining room and set off for the beach about noon. The tender process was relatively quick and efficient since they were using the island tenders which were large and roomy. We first did a bit of shopping around the "village" near the entry. Rod got a nice straw hat for $10 that fit well and was more comfortable than the black wool felt hat he was wearing. Not much else struck a chord so we headed for the beach. We had booked a "clam shell" shelter along with a couple of lounge chairs so we then went to claim that. Lillian was still favouring a sprained ankle from August so she crashed in a lounge while Rod wandered off to walk the beach. Rod finally wandered back and we took a walk along the paved paths to the Tropics Restaurant where the ship's food team were serving a decent buffet lunch. We then wandered out to the Captain Morgan's Bar which was housed in a simulated ship wreck. A couple of Margueritas hit the spot. We slowly wandered back to the welcome center and picked up a tender back to the ship. Back on board we relaxed for a bit. The ship weighed anchor at about 15:45 and headed off on the long sail to San Juan. We had a bite of dinner, bummed around the bars and such until about 01:00. We did pop in to the 22:00 show in the showroom. Some lame comic "Steve Shaffer" was on stage. We gave up after about 15 minutes. Today is a lazy sea day while the ship makes its way passing north of the Bahamas, Turks & Caicos and Hispaniola on its way to Puerto Rico. We grabbed some breakfast and dropped in to the Culinary Arts Center where the Pinnacle Chef was showing how some of their specialty dishes were prepared. In the afternoon we attended a Future Cruise Presentation as well as a presentation by the location guide on Bridgetown, Barbados and Castries, St. Lucia. It was also the first "Sip & Savour", a deal where they do a pairing of an appetizer selected by the Culinary Arts Center with a wine selected by the cellar master. They charge $4 which is not bad for a decent glass of wine and a snack. Since it was a "Gala Night" and there was nothing on the dining room menu of special interest, we decided to forage at the Lido Restaurant for dinner. We later popped in to the Showroom for a show billed as "A Musical Journey Around Europe". It was presented by the ship's song and dance troupe and was decent. The rest of the time we enjoyed the music in the various bars etc. The ship was docked at 07:34 after having sailed 669 nautical miles at an average speed of 17.9 Kts. since leaving Half Moon Cay. We had decided in advance that we were going to stay aboard for the day. We have visited San Juan three times before albeit many years ago when we used to sail from there for the southern Caribbean. We wanted to take advantage of the spa discounts on shore days and indulge in a "couples massage" as we have previously done. We were watching our time since the clocks had rolled forward an hour overnight. We grabbed a bite of breakfast. We enjoyed our massages done by a couple of competent ladies from the Philippians who seemed to enjoy our sense of humour as we nattered back and forth. It was good for the body and the soul. Beyond that it was a lazy day. We spent some time taking picture from The Retreat on Lido aft before making our way to Sip and Savour. The ship sailed pretty much on time at 17:02 and Rod took some pictures through the windows as we sipped and savoured. We spent a suitably mellow and unmemorable evening. The ship was docked at 07:41 after having sailed 188 nautical miles at an average speed of 14.6 Kts. since leaving San Juan. Today is our first real excursion which was billed as: St Maarten Scoot Coupe. We thought this was a cute concept and we wanted to visit the Orient Beach area again. It turned out to be quite the "adventure" though far from what we had in mind. Rather than expand all the details here we have put them in their own Scoot Coupe (Mis)Adventure page. We got back to the ship somewhat more sun toasted than planned and more than a bit disgruntled but we were early enough (all aboard was 22:30) to do some walking around Philipsburg and enjoy a beer on the local beach. Back at the ship they had a Caribbean Dinner on at the Lido which suited us just fine. After dinner we caught most of the show "LIVEWIRE - A Whirlwind Of Music & Celtic Spirit" which was excellent. We then spent a typical evening absorbing music and libations. We headed to The Retreat about 21:00 where they were advertising "Port & Cognac Under The Stars" but more importantly they were having a Happy Hour (2nd drink for $2) so we hung out there and visited with some friends we made, listened to steel pan music and enjoyed a late sailing around 22:51. The ship was docked at 08:01 after having sailed 92 nautical miles at an average speed of 12.4 Kts. since leaving Philipsburg. It's Christmas Eve. We decided not to book any excursions until Barbados to recover from being road-baked in Sint Maarten. Rather we decided to have a leisurely breakfast then go bum around St. John's. The had the usual cruise port shopping village with most of the usual vendors found in cruise ports around the Americas. It was also infested with cab drivers and others trying to sell tours, beach trips etc. They were persistent but polite. We spent most of our time in the town proper exploring various markets etc. The area was packed with locals doing last minute shopping and the mood was cheery. We made it back in time for "Sip & Savour" just as the ship sailed at 17:09 after which we had some dinner and hung our at some of our usual haunts. We skipped the main show but turned up in the Showroom for the crew's "Sounds of Christmas Concert". They had various crew performing including a Philippians choir and an Indonesian choir. Great Fun. Since no port really wants any ships on Christmas day we were cruising moderate seas working our way the 343 nautical miles to Barbados. We enjoyed a relaxing morning then dropped in to the Culinary Center around 13:00 to watch a cake decorating competition by some crew members. After that we moved on to the Navigator Wine Tasting in the dining room at 14:00. This was included with the "Cellar Master" package which we purchased before sailing. This includes 5 bottles of wine, a couple of tasting events and 2 meals in the Pinnacle. The cellar master Raj did a good presentation including some pointers on wine tasting and his pairings with various morsels supplied were very good. On our way back we popped in to the Pinnacle and found they had room for us for dinner. We figured that if we had to dress up, it may as well be for the Pinnacle. We dropped in to "Sip and Savour" at 17:00 then relaxed until dinner. Dinner at the Pinnacle was most enjoyable as usual. Service was excellent and good humoured. Lillian had a shrimp cocktail appetiser and Rod had their Lobster Bisque. Both were excellent but the Bisque was very filling. For mains we both had the small filet mignon to which Lillian added an optional lobster tail for us to share. The beef was excellent but the lobster tail was a bit tough (over cooked) and salty. We topped off with Creme Brule, Coffee and Cognac. After dinner we waddled off to our usual haunts for the rest of the evening. The ship was docked at 07:32 after having sailed 343 nautical miles at an average speed of 9.3 Kts. since leaving St. John's. We were sharing the harbour with Celebrity Summit and Equinox and the Royal Princess. Today we have our second excursion billed as "Five-Star Catamaran & Turtle Encounter". What a difference from the last excursion. This was operated by Tiami Catamaran Cruises which was quite the flash back for us as we used to sail on the Tiami and Wind Warrior about 25 years ago when they were based in the Careenage pretty much in the center of Bridgetown. They were a class act then and they still are. Now they are based in the Shallow Draught area a bit to the north of the cruise terminal. We were picked up on time, transferred to Shallow Draught and promptly boarded after some paperwork. We first headed to the south where the first snorkling stop was planned. On the way equipment was handed out and sized and folks were briefed on proper technique. There was plenty of equipment available (though no fins) and it all seemed to be in good shape. We passed on the snorkling for a variety of reasons but we still got to see some turtles as they surfaced. Next we swung back north to a site with a couple of wrecks. Again we skipped the snorkling though Rod went in for a swim to freshen up and ease the sun itch from the coupe day. Once we were back aboard the snorling gear was collected and an excellent buffet laid out. Now than snorkling was done the alcoholic drinks were made available (non-alcoholic drinks and snacks were availiable earlier). Finally we moved on to a nice beach where the brought the cat in as close as possible so we both head ashore. Rod spent most of the time in the water swimming about and chatting with various folks from other ships and resorts. Finally the blew the horn and it was time to head back to Shallow Draught. Super vessel, super crew, super day. We had to buy a T-shirt - our old Tiami T's were long dead. We made it back for Sip and Savour and a typical evening. The ship was docked at 07:18 after having sailed 112 nautical miles at an average speed of 8.9 Kts. since leaving Bridgetown. Celebrity Summit was with us again today. Today's excursion was Northern Highlights & Beach. The last time we were in St. Lucia we had taken the tour south to the Pitons and the "drive in volcano". Today we chose a bit of beach to the north. While not as long a drive as the tour to the south, there was still plenty of hair-raising hills and switch backs. Our first stop was Caribelle Batik Silk Studios. The silk screening technique was interesting but the view was better. We then made another scenic stop at Pigeon Point Beach near Pigeon Island National Landmark. We were surprised to see the Club Med 2 anchored off shore - we did not know it was still operating. We then headed back around Rodney Bay to Reduit Beach, our ultimate destination, where we wnjoyed some beach time before heading back to Castries. The ship sailed from Castries at 14:59 and headed down to Soufriere Bay and took a casual cruise around the area so we could enjoy the sceneries - especially Les Pitons. The Club Med 2 was also doing a similar viewing. We then headed of for Sip and Savour at 17:00 followed by dinner and a typical evening. The ship was docked at 07:23 after having sailed 138 nautical miles at an average speed of 9.9 Kts. since leaving Castries. We seemed to be on our own in port today. Today's excursion was Star Wind Catamaran & Snorkel Adventure. As you can tell, we like these type of excursions. While not as spiffy as the Tiami product in Barbados, this was a well run excursion. Again we took a pass on snorkling though Rod did enjoy some warm salt water in Flamingo Bay the we both enjoyed some beach time at the beach stop on the way back to St. George's. We also had a bit of a tour of St. George's as we were bussed back and forth. Back at the ship we relaxed until time for the ship to sail at 16:54 then Sip and Savour at 17:00 followed by dinner and another typical evening. Click for pictures from Day 10. The ship was docked at 07:37 after having sailed 197 nautical miles at an average speed of 15.1 Kts. since leaving St. George's. We did not plan any excursions for the day but we did go ashore to walk around the local market. It was not too exciting and we were pretty shopped out so we headed back to the ship and enjoyed the day either hanging out on the lower promenade deck ourside our room or up on The Retreat until the ship sailed at 16:47. We did go to the show to see "Comedy and Conversation with Frank King". It was a good show and we had some good laughs. The ship was docked at 07:54 after having sailed 268 nautical miles at an average speed of 19.5 Kts. since leaving Roseau. Our last port of call! It has gone quickly. Again we did not plan any excursions but had a good tour around the town on "shank's mare". It is a fairly modern town and the folks are friendly. Traffic was busy so we were glad not to be trying to drive around. We eventually worked our way back to Tortola Pier Park, a very new cruise port shopping area that has gone up in the last couple of years as the island works to attract more cruise traffic. We had a nice wander mostly ignoring all the usual stores and ended up dropping in to Aroma's, a "Cigar, Wine & Martini Bar". It was comfortable, Lillian could smoke, there was free WiFi and the made us the best Margueritas we had on the whole trip. After enjoying 2 each and having an interesting chat with the lad working the bar, we headed back to the ship in a mellow mood. The ship sailed at 16:51 as we were heading to Sip and Savour followed by a typical evening. Today we are sailing back to Fort Lauderdale. At noon we were somewhere north of the Dominican Republic. Since we had time on our hands and the spa was offering some discounts, Rod went for another massage and Lillian did a smaller one on her leg and ankle to work on the sprain that has been hanging about since August. Other than that we spent a quiet day around the ship. We actually hung out a lot of the day on the lower promende in the deck chairs outside our room using up some of the potables we had there. We did retreat for a bit when the combination of the wind and ship speed was kicking up some spray. Our usual haunt of The Retreat on Lido aft was being transformed for the big party later so we were better avoiding that. We also used the time to do some packing now that we were done with ports. In the afternoon we attended the premium wine tasting in the Pinnacle that was part of our cellar master package. Raj did a fine presentation and had selected some nice wines. You can see them in today's pictures. By the time we were done we skipped Sip and Savour feeling that it would be ante-climatic. Eventually we dressed up for some dinner in the dining room (surf & turf as I recall with better lobster than the one we shared in the Pinnacle). After dinner we got more comfortable then headed back to The Retreat to hang out with some friends and listen to some Steel Pan music. As the evening progressed The Retreat was becoming crowded and noisy so we went hunting for somewhere more to our taste. After a couple of stops we ended up in the Crow's Nest up forward on deck 9. The usual entertainment from the Crow's Nest was working The Retreat so we had The Band that usually worked the Ocean Bar supplying some good music that was not deafening. The seats were comfortable and the bar was not overcrowded so service was good. The only thing not perfect was the view out the front windows - it was too dark. So we relaxed, had some drinks, listened to some music and waited for the new year. At midnight we toasted the new year, listened to a bit more music the beat a path back to our room before the crowd from The Retreat moved up at 00:30. 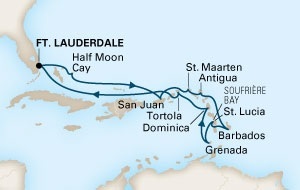 New Year's Day finds us further down the track to Fort Lauderdale passing around The Bahamas. At noon we were near Cat Island. New Year's Day was quiet. After a good breakfast we hung out near the room alternately relaxing in the deck chairs outside and getting enough packing done so we would be able to get out bags out on time. You can see some of the other ships coming and going along the same course in today's pictures. There may have been others on our port side but our room was on the starboard side. We also spent some time on The Retreat, which was already cleaned up, having a last visit with some friends we had met on the cruise. We eventually went foraging for dinner at the Lido Restaurant then went to finish packing. The ship was docked at 06:12 after having sailed 1009 nautical miles at an average speed of 16.5 Kts. since leaving Road Town. We grabbed an early breakfast at the Lido Restaurant the headed back to our room to wait for our disembarkation call. They started a bit late but were pretty much caught up by the time they got to our group. It is incredible how thick and self-focused some folks are. It was well publicized that we should not hang around the gangway until we were called but there was a pack of folks stuffing the halls the were several groups behind us. The transfer to FLL and check in were uneventful giving us time to have a snack and a drink while we waited to board. The hazards of holiday travel - they were running late and we did not board and get under way until about an hour late. This would not be any big deal but we were going back by way of Pearson and our connection was a bit tight and we were back near the tail of a 767. We will give Air Canada points for once. As we worked our way towards our gate at Pearson we were intercepted and given new boarding passes for a flight leaving 30 minutes later than ours thus relieving all the pressure. The rest of the trip was uneventful.